iTunes is a great app to enjoy movies and TV shows you have, but most videos like AVI, WMV, MKV, M2TS cannot be played directly on iTunes due to the video format restriction of this video player. If you are one of those who needs a media player that can play all kinds of video files, here you are advised to download free 5KPlayer to end the video format restriction thoroughly. 5KPlayer is a new-style media player and now it is available for Windows even Windows 10 (Preview build) and Mac. What is 5KPlayer capable of? Free but powerful. 5KPlayer assures your computer of strong media playback abilities to play everything stored in your media library, be it a video or audio. With 5KPlayer, you can play any kinds of videos such as MKV, M2TS, MP4, AVI, WMV, FLV, etc. with low CPU cost. It also helps play music files that are in AAC, AC3, WMA, FLAC and ALAC file extensions. If you look closer, it is not hard to find that this 4K/5K/1080p video player also comes down to a region-free DVD player which is capable of playing DVDs smoothly. By the way, here is another choice to watch DVD. If you need to rip DVD and watch DVD movies on handsets such as iPhone, iPad, Android, etc without using DVD discs, WinX DVD Ripper Platinum is the best way to go. 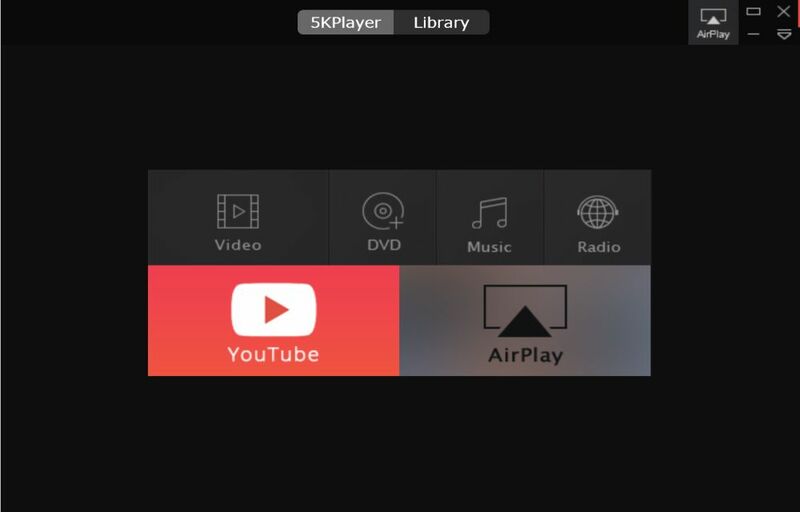 More than a free media player, 5KPlayer is a free AirPlay receiver/sender supporting AirPlay tech. It allows you to AirPlay video or music files from iOS devices to PC or Apple TV and enjoys them on bigger screen wirelessly and instantly. You just need to add your iOS devices and computer to the same network and connect one to another for AirPlay. However, AirPlay only allows for MPEG4 and H.264. To be more precise, if the video you have is not supported by AirPlay, you have to re-encode it. Handbrake is an open source software for re-encoding. Another good Handbrake alternative is WinX HD Video Converter Deluxe, which can convert various video files for AirPlay streaming. Playing 4K videos online requires a 25Mb/s or faster downstream connection. If your connection is lower than that, you can use 5KPlayer and free download 4K videos for offline view. 5KPlayer is capable of downloading online videos including 4K videos from more than 300 online video websites. Read the guide below to know how to download 4K videos from YT. Step 1. Find a 4K video on YT. Step 2. Open 5KPlayer and click YT tab, and tap Paste URL & Analyze. Step 3. Click the Download button to download 4K video from YT.